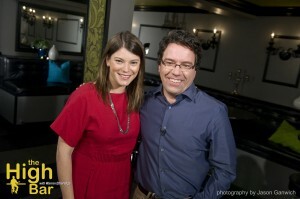 If we are what we eat, Gail Simmons is the most worldly woman. As a perennial judge on Top Chef and the host of Top Chef: Just Desserts , Gail has tried and critiqued just about every imaginable dish. Today, the boisterous and beautiful Ms. Simmons visits Warren Etheredge at The High Bar to promote her delectable memoir, Talking with My Mouth Full , and to raise a toast to and raise the bar for… eating professionally!